Back in the summer of 1997 I had a terrifying experience with what I now know to be the phenomenon known as the black eyed people. At the time I had never heard of these beings and have been bothered by the experience for many years. It’s only just occurred to me to scour the internet to see if anyone else has ever witnessed anything like it as I knew that I couldn’t possibly be the only one that this has happened to. My encounter differs from any that I have now discovered so far as they were not trying to communicate with me but was rather trying to keep away from me! Which believe me I now know that that is a good thing. Also it differs in the fact that my experience happened in broad daylight rather than late at night like the others I have read. It was a hot sunny summer day in 1997. I was about 15 at the time and was out with my friends. I live in a small town called Grantham in Lincolnshire in the UK. While out with my friends I was not far from my home and decided to go home to grab a quick drink and my two friends accompanied me down to my house and waited outside whilst I went in to have a drink of water. I was quite thirsty so quickly drank 2 pints of water then went back outside. My friends had gone so I decided I would walk back to my friends house which was round the other side of of the block. As I walked up the path to the street I happened to look about 5 houses down where my mum's friend lived. At the front of her garden she had a wooden fence at the time and a driveway on the furthest side of the garden there was also a wooden fence and just behind it there were two very large conifer trees that overhung the fence. So looking down the street I saw two people backed up to the fence and the top of them was pushed back into the overhanging conifers so I only saw the 2 pairs of legs. Thinking that these were my friends messing around with me I started walking down towards them. As I got closer to them I shouted out “come on you two, I can see you hiding there”. Thinking that they would come out laughing, I smiled to myself. But instead of coming out they managed to jump up into the conifers, over the fence and come out in my mum's friends garden! (at this point I was thinking how they could of done this because the foliage on the trees was pretty thick). They didn’t stop there. They turned around towards the next garden and managed to climb over the 5 ft. fence panel. As I watched them weirdly go over the panel I shouted again to stop messing around. I said that it was weird the way they got over the fence because it wasn’t a hop or a jump. I can only describe it as lizard like! That’s the only way that comes to my mind to describe it. So I kept walking down the road and watched as they went over a 6ft gate into the next door's back garden. So I thought to myself I know what to do. I would carry on walking and catch them when they come out of the next garden. I picked up my pace carried on and caught sight of them in the next garden and stopped dead in my tracks as I looked in horror at what I’d been chasing! They stood a few feet away from each other. One looked like a teenager. He was wearing the fashion of the time which was a blue puffa jacket which was zipped up. He was wearing the jogging bottoms that had studs up the legs which were called poppers. Trainers. And a baseball cap. I didn’t look at his face as the other one caught my attention nearly straight away. This one was much older. Very pale skin. The top of his head was completely bald but around the side of his head he had long greasy black hair down to the middle of his back. He was wearing a long trench coat which went down to his ankles. He was wearing boots. His hands had long fingers that ended with sharp looking dirty nails. He had a big hooked nose and his eyes were pure black. It looked so evil. As my eyes met his it felt like time had stood still. Nothing was moving. Not a leaf. No breeze. Nobody else in the street. Silence. I couldn’t move as I was paralyzed with fear and terror. I knew it was staring at me into my eyes - maybe into my soul. I stood rooted to the spot for what felt like hours but must of been maybe 5 minutes. I broke the eye contact turned and ran for what felt like my life back to my house. When I got indoors I sat down and cried like a big baby. I couldn’t console myself. It took me a while to compose myself and tell my parents what had happened. They didn’t know what to do. I sat down and drew what I had seen. I still have the drawing today. Not that I need it. That image is well and truly etched into my mind and I would probably draw the exact same one in another 30 years time. I don’t know what this thing is. It definitely was not human. Over the years it has played on my mind bringing many questions and no answers. I’ve thought it was either alien or demon or any monster in-between. Some of the questions it’s brought me apart from what is it. How did they climb the fence like they did? Why were they wearing large coats on a boiling hot day? After reading other accounts of them why were they out in the middle of the day on a normal street in a small town? Why did they run from me? 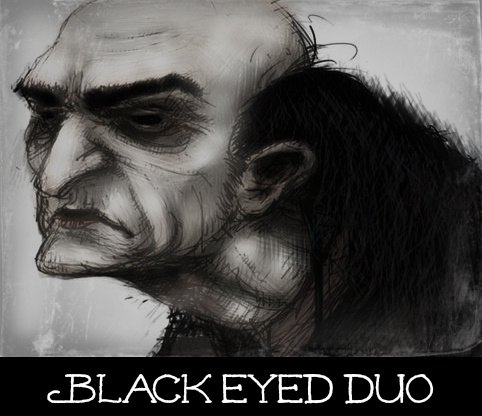 I hope no one ever has the experience of these black eyed beings and if you see one run for it. P.S. it turned out that my friends went straight back home when they left me. I was quite angry with them for a while and told them what had happened for them to laugh at me and think I was joking.